LAWRENCE — The famed gastronome Jean Anthelme Brillat-Savarin is known for saying, "Tell me what you eat, and I'll tell you what you are." But a University of Kansas specialist on Japanese pre-modern cultural history in his new book tackles a twist on the 18th century Frenchman's assertion. "The basic idea is that we sometimes think of cuisine as being very ordinary, such as Japanese or Chinese cuisine," said Eric Rath, professor of history. "However, I argue that cuisine is an ideology." 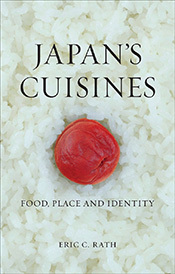 In his book "Japan's Cuisines: Food, Place and Identity," Rath examines the story of how the Japanese state and institutions historically have tried to create cuisines in attempts to shape people's identities. When an institution does seek to brand a certain type of food as a "national cuisine," it can lead to oversimplification or an incomplete picture in identifying what people eat, he said. "Ideology is narrow in its focus, and when you look at what people ate, it's a much wider variety of food," Rath said. He examines the Japanese government's effort in 2013 to get washoku, sometimes referred to as "traditional Japanese dietary cultures," on UNESCO's Intangible Cultural Heritage list. The cuisine is based largely on rice with miso soup and other dishes, such as fish, pickled vegetables and vegetables cooked in broth. Grilled fish, sushi or tempura are also common. Rath said while getting Japanese cuisine added to the UNESCO list is recognized as something very prestigious, it was obvious the Japanese government had other motivation for the distinction, especially after the 2011 earthquake and the subsequent nuclear meltdowns at the Fukushima nuclear power plant as the world worried about subsequent pollution and Japan's food supply. "It's a message to the world that Japanese cuisine is safe to eat after the Fukushima nuclear disaster," he said. "When the government made its pitch, the leaders said they want this listing for the purpose to recognize the quality of Japanese food and that we've recovered from this tragedy." This soft power example shows how the Japanese government used cuisine as a vehicle to send a message that was ultimately aimed at helping the nation's economy. Similarly in Japanese history, the government during World War II created a new type of cuisine as a way to put a positive spin on rationing, Rath said. "It was an attempt to try and mobilize people in the war effort but also to put a more positive face on rationing and to interject nutrition into people's diets, such as by counting calories and adjusting portions," he said. During World War II, local foods, especially in rural areas, that were undesirable before the war, then became more desirable — and celebrated by the government — because they were the antithesis of what was being rationed, Rath said. "The category of so-called 'local food' was really the invention of the wartime central government," he said. He hopes the book will lead people to think more deeply about what types of cuisine are celebrated, not only in Japan but in other cultures as well, and if there could be a more complex motivation behind the message than just a simple appreciation of the food. "If people tell you there's a single cuisine, watch out because that's a power play," he said. "Instead, you have to look to the diversity and use that as a way to question the assumptions behind those singular cuisines. We just have to be aware of cuisine because we think about food in a very neutral way. Oftentimes, food can be so mundane that we don't think about it. But cuisines are efforts to connect our mental life with our material life and our embodied life. What people are saying about food is a message that is trying to shape behavior."